2012 has already proved to be a very busy year as far (hence why I haven’t blogged for the last month). Over the New Year, I read and enjoyed a lot of lovely blog posts with round ups of 2011 and a look ahead to 2012 however when ever I sat down to type something came up (you know how it is!). We’ve had the dreaded colds that have been flying around (not badly and we’re all better now, well almost anyway), then it was my little man’s birthday; going back to work etc etc. It’s been a good month so far though (I managed to escape the worst of the said colds). I know it’s traditional to make New Year resolutions but as a general rule I steer clear of them. This year however I have got as near to one as I think I’m likely to get. Towards the end of last year I was having a good think about crafting in 2012, what I wanted to do and how I could be more economical in doing it. I am really inspired by the recent ‘make do and mend’ mentality. The idea of using old things to create new things, is good on so many levels. It can also be a creative and fun challenge (which, to be honest keeps me sane when little man is having a particularly stubborn day!). So I have decided to buy as little as possible this year when doing my projects. The aim is to use what I already have in my sewing and wool stash (which is fairly extensive so I’m sure I won’t have too many problems). I am a bit of a magpie when it comes to all things crafty (I am especially partial to a lovely piece of fabric or lace in a charity shop!). I have also decided to knit/crochet things from my stash rather than buying new wool where possible. I think that is going to be more hard than using the fabric and ribbon that I have squirrelled away as most of my wool stash is ends of other projects. There might be a few blankets! I know that my husband reads this blog so I’m sure he will hold me to it! lol. I should probably say that it looks better in real life, it’s me that is rubbish at taking photos! My friend gave me these faux pearls from a broken necklace for Christmas with the challenge of doing something ‘creative’ with them. Well this is what I came up with. I couldn’t walk by so many wonderful branches without bringing some of them home (my poor hubby!) but of course I then had to do something with them. I decided to tie the pearls on some yellow glittery thread and hang them off it. It actually looks very effective. I think I might hang a few more things off it when I get a chance (I have some broken earrings and things that would be fun). It’s wonderfully versatile that way! If you fancy doing something similar, all you need is something to decorate (there are lots of twigs lying around at the moment) and something to decorate with (broken jewellery; ribbon; small toys; your imagination is the limit!). 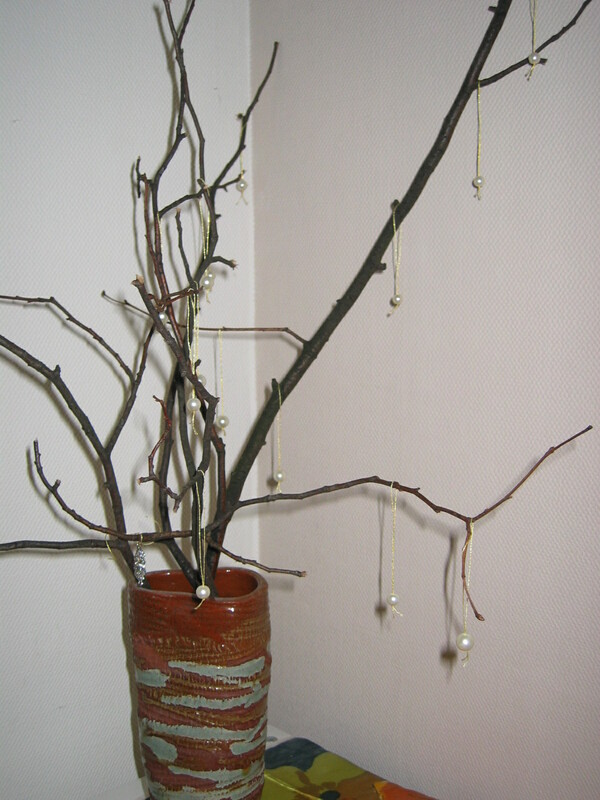 A couple of hints; if you choose twigs, find ones that are strong enough to hold what you want to hang. Also if you are threading beads or pearls, using a needle thread thing really speeds up the process! Make Do and Mend it!